Mojacar is the most popular beach resort in the Costa Almeria region of Spain so naturally many people will want to see what the town actually looks like. This is possible through live webcams which are usually on all the time, streaming live video footage via the many cameras set up permanently. If you have any web cams to add to our list, please email us (see bottom of page for details). Did you know Mojacar is actually split into two separate sections? Head for the Plaza Nueva, see the famous statue of Mojaquera in front of the Santa Maria church, the Moorish fountain (La Fuente Mora) and climb up to the Mirador Castillo (castle). Then only 2km away is the new modern beach resort of Mojacar Playa where the majority of visitors stay and this is where most of the cameras are located. Our main page has more Mojacar tourist information. Webcams are also handy if you are curious not just to know what the temperatures are today but also to see the weather conditions live! The weather and climate are a major reason for the popularity of Mojacar, the region of Costa Almeria is one of the driest areas in Spain with consistent temperatures and lack of rainfall compared to areas such as Madrid or the Costa Brava. We can describe Mojacar as a good resort for families. There are 17km of beaches, they are certainly not the best in Spain but they are sandy beaches with plenty of excellent beach bars and restaurants. Try the Mandala Beach Club for nightlife and the Beachcomber for a memorable meal out. There is a water park near the town of Vera and plenty of golf courses. The nearest airport is Almeria airport but to the north, Murcia and Alicante are good options with many cheap flights. 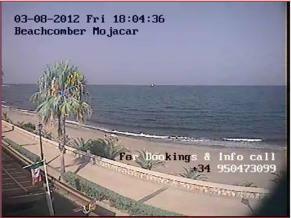 Three Mojacar webcamsoperating from the Beachcomber restaurant in Mojacar. As this is right on the playa (beach) you can see exactly how it would be to take a holiday here.This restaurant is also regarded as one of the best places to eat out so maybe you could be sitting here watching these same views for real one day? A trip south to the national park of Cabo de Gata is a must, there are some excellent secluded beaches here which are so unspoilt. You will have to hire a car to get there. June is a good time, the weather is bearable compared to July and August and you can see the famous Moors and Christians celebrations known in Spain as a fiesta (party). Page Summary – On this page we list the web cameras that are situated in the seaside resort of Mojacar in the Almeria region of Spain. You can see the latest weather conditions in real-time and views of the beaches. 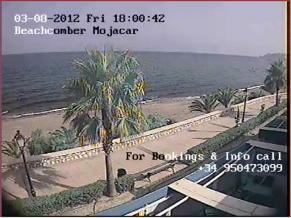 I can’t find one either – have found Vera but that’s not Mojacar ! !